Why No Industrial Revolution in Ancient Greece? The "insufficient density" theory--not enough thinkers, not enough tinkerers, not enough ability to shape metal finely and precisely for the set of those interested in scientific progress and technological development to reach critical mass. The "lack of a market economy" theory: those who would have sought wealth and power through entrepreneurship and enterprise in a modern market economy instead, because trade was small in volume and under the thumb of politics, went into the army or into politics. This misallocation of talent stalled human progress. Fuzzier explanations based on the role of slavery in classical civilization and on the elective anti-affinity between the existence of slavery on the one hand and elite interest in boosting productivity on the other. Economist.com | The Antikythera mechanism: ...That tallies with ancient sources that refer to such devices. Cicero, writing in the first century BC, mentions an instrument “recently constructed by our friend Poseidonius, which at each revolution reproduces the same motions of the sun, the moon and the five planets.” Archimedes is also said to have made a small planetarium, and two such devices were said to have been rescued from Syracuse when it fell in 212BC. This reconstruction suggests such references can now be taken literally. WHEN a Greek sponge diver called Elias Stadiatos discovered the wreck of a cargo ship off the tiny island of Antikythera in 1900, it was the statues lying on the seabed that made the greatest impression on him. He returned to the surface, removed his helmet, and gabbled that he had found a heap of dead, naked women. The ship's cargo of luxury goods also included jewellery, pottery, fine furniture, wine and bronzes dating back to the first century BC. 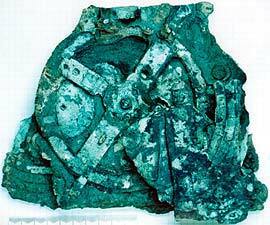 But the most important finds proved to be a few green, corroded lumps—the last remnants of an elaborate mechanical device. In some cases, says Mr Wright, Price seems to have “massaged” the number of teeth on particular gears (most of which are, admittedly, incomplete) in order to arrive at significant astronomical ratios. Price's account also, he says, displays internal contradictions, selective use of evidence and unwarranted speculation. In particular, it postulates an elaborate reversal mechanism to get some gears to turn in the right direction. Since so little of the mechanism survives, some guesswork is unavoidable. But Mr Wright noticed a fixed boss at the centre of the mechanism's main wheel. To his instrument-maker's eye, this was suggestive of a fixed central gear around which other moving gears could rotate. This does away with the need for Price's reversal mechanism and leads to the idea that the device was specifically designed to model a particular form of “epicyclic” motion. A device that just modelled the motions of the sun, moon, Mercury and Venus does not make much sense. But if an upper layer of mechanism had been built, and lost, these extra gears could have modelled the motions of the three other planets known at the time—Mars, Jupiter and Saturn. In other words, the device may have been able to predict the positions of the known celestial bodies for any given date with a respectable degree of accuracy, using bronze pointers on a circular dial with the constellations of the zodiac running round its edge. Mr Wright devised a putative model in which the mechanisms for each celestial body stack up like layers in a sandwich, and started building it in his workshop. The completed reconstruction, details of which appeared in an article in the Horological Journal in May, went on display this week at Technopolis, a museum in Athens. By winding a knob on the side, celestial bodies can be made to advance and retreat so that their positions on any chosen date can be determined. Mr Wright says his device could have been built using ancient tools because the ancient Greeks had saws whose teeth were cut using v-shaped files—a task that is similar to the cutting of teeth on a gear wheel. He has even made several examples by hand. That tallies with ancient sources that refer to such devices. Cicero, writing in the first century BC, mentions an instrument “recently constructed by our friend Poseidonius, which at each revolution reproduces the same motions of the sun, the moon and the five planets.” Archimedes is also said to have made a small planetarium, and two such devices were said to have been rescued from Syracuse when it fell in 212BC. This reconstruction suggests such references can now be taken literally. "The role of slavery in classical civilization and the elective anti-affinity between the existence of slavery on the one hand and elite interest in boosting productivity on the other." An interesting point. Would there be the same anti-affinity between colonialism and productivity? Even in former colonial areas with fine natural resource bases, there has often been little use made of the bases to enhance productivity. I once asked my Classics professor, Dr. Berkeley Peabody, a world expert in Greek translations: Why didn't the Greeks invent the phonograph? They had the theory of sound as waves, and could have come up with a crude mechanism to record it; the tin foil cylindar is not all that high tech. There was, quite simply, no reason to make machines way back then. There were thinkers and tinkerers (often the same people), but unless there was a practical use for something (like a gizmo to track the motion of the planets, which was a major part of their religion), why make it? I find it amusing when someone assumes that people in every time period, in every situaton, think just like us. Egotism at its funniest. Translation of Hero's Treatise on Pneumatics, includes his design for a steam engine. What about the climate as a major role? When I visited I remember it being HOT. I only wanted to sip a cold beer as close to the sea as I could get. What about the lack of a printing press and a common language through which technological information could be dispersed? Shurely it is hard to reconcile the second kind of argument with the history of China? I read recently (I can't remember where) that some Greek actually invented a crude prototype printing press 2000 years before Gutenberg, but it was dismissed as a toy. Is there a name for this kind of "what if" theorizing? Why didn't the Arabs develop modern technology before the barbarian Europeans? Why didn't North American Indians and Australian Aborigines develop metalworking and written languages? Why did the Chinese abandon sea-faring? One of the best (to me---I don't know enough to see the flaws in the arguments, if there are any) books on this sort of topic is "Guns, Germs and Steel" by Jared Diamond. He tries to uncover why civilization (technology, big government, weapons, written language) only developed in a small number of places in the world, and not in Australia or the Western Hemisphere. He was at pains to find a non-racist explanation (that is, an explanation other than "Civilization developed in the West because Europeans are smarter than the savages"), and I think he succeeds. While the Greeks excelled at geometric mathematics, they lacked (to my understanding) the concepts of statistics and probability, which did not get started until Galileo. Further there was a strong Pythagorean and Platonic disposition not to take reality as seriously as abstractions. I wonder how much influence Aristotle had verses Plato, in his own time. While certainly people made careful observations about reality, I don’t think they were conceptually equipped to conduct science in an experimental way. The lack of an experimental method would also have greatly slowed down progress in engineering. No coal, no cotton. Ironwork was from the smithy only, and bronze was still common. The olive and the vine still aren't very amenable to mechanized agriculture. Wool seems to have been an order of magnitude harder to develop mechanical processes to work than cotton, historically speaking, so that's a difficult barrier to overcome. I suspect that primitive steam-powered pumps in the silver mines would have been more expensive than a slave-powered bucket brigade equivalent. And if Athenian pottery manufacture wasn't as organized as Josiah Wedgwood's already, I would be very surprised. Technological progress was always occuring, and if you were to graph invention versus time, I guess it would make a parabola. People living around 1500 AD had better technology on average than people living in ancient Greece. I think it's just that enough time hadn't passed for the small things invented over time to enable fast enough invention for an industrial revolution. Several days ago, there was an interesting article in the NYTimes about a modified wheel barrow that was designed for the women of Malawi. African women ihn rural areas often carry bundles on their heads, but an easy to wheel barrow makes more sense. The barrow is catching on in Malawi, and is a significant technological advance. The idea and design for the Malawi barrow seem wonderfully simple. Why then has it not been thought of and produced long before? Bill Gates has spoken about the importance of "simple" innovations in setting the stage for great gains. An industrial revolution needs some degree of scale to be successful. The up-front cost of additional capital investment must be spread over as many units as possible in order for new products to be affordable. Which brings me to a question: how did population of ancient Greece compare to that of 18th century Britain? That is, how different was the market size for innovative products in these two settings? From the political economy standpoint, an industrial revolution always has an agent, some group within the society, which, as a result of the revolution, becomes the political class. Would the warrior leaders of Athens (let alone Sparta) simply stand by and watch the merchant class taking away their political powers? Women in Malawi are benefiting from the invention of a simple handcart that uses inexpensive native materials. Perhaps we need to look to specific cultures and environments rather than generalize, then consider plans for technology advance just as specifically. Perhaps there is an essential distinction between tools and toys, and threshold materials for one are not practicable for the other. A complex machine devised as a tabletop amusement need not bear repeated severe stresses, and it need not be easily reproduced and/or repaired. A satisfactory complex machine tool (or component) faces high duty cycles under challenging loads, and does not become a satisfactory cultural "core competency" unless you can make many of them and keep them in service. Appreciation of mechanical principles is evident in pre-industrial toys, in simple machines built large (a ship's rudder and riggings, a wind/water-wheel and mill, devices used in constructing monumental architecture), and in light-load devices with high parts count and high duty cycle demand (clocks, looms). But (confined to preindustrial materials and methods) it's easier to create big strong durable components than small strong durable components ... but LARGE durable complex machines have limited practical applications, require large prime movers, and fail under their own weight at some intermediate level of complexity. By analogy, principles of machine computation were explored in the 19th century, but did not become practical until the late electro-mechanical era, and took quantum leaps with the advent of vacuum-tube electronics and again with solid-state electronics. Who made all those vases and statues then? This is surely a misapplication of Jared Diamond's theories! Speaking as a physicist, I think the whole debate is framed with an inaccurate view of the scientific revolution in Europe. The Greeks were very accomplished mathematically, but they had a pervasive disdain for empiricism that kept them from doing anything that could be called physics. Later in Europe there were people like Francis Bacon and Galileo who emphasized the dual-approach of experiment and theory. This, and our stroke of luck in having Newton among us - something to be appreciated and not underestimated - created physics. Perhaps my view is tainted, but I think physics was an essential ingredient in the industrial revolution. As a clarifying aside: the Greek who was closest to empirical was probably Aristotle (who, after all, engaged in biological classification). Yet he provides us with a great example of what physics isn't: he argued that the earth could not go around the sun because he realized that centripetal acceleration would then cause objects on the earth to go flying off (at night). His reasoning is correct and the effect is real: we do weigh less at night for precisely this reason. But obviously it's not the dominant effect, when compared to the earth's gravity. That he got it wrong is forgivable. That he considered it settled, by reasoning alone, is symptomatic of the Greek shortcoming. In my limited reading about ancient technolocy, I am impressed with the amount of inventions, even inventions that have made the leap to technology, that have been lost and had to be recreated. This is, or course, not the answer to why there was no technological revolution. It is just a more particular statement, a part of the problem. It strikes me, though, that that is the way to go at the problem - figure out why inventions didn't develop into technology, why technology wasn't transfered at a rapid rate, why it was allowed to die. This is separate from questions about the pace of invention, though related (bigger payoff to inventions would, presumably, lead to more deliberate effort at invention). Some possible directions come to mind. "Insufficient density" can be seen on a global basis. If there is sufficient local density to foster advances in metal working, but insufficient density in surrounding areas to foster its spread, then it is less likely to match up to another advancement, so develop further. Much of technological advance is incremental, matching up my little bit with yours. If advances don't spread fast, then they are prone to disappear with the parent culture. By the way, isn't the latest thinking that Egypt's pyramids were built by paid workers, who were freed from the land on a seasonal basis by flooding? Weren't Greek warriors (at times even Athenian warriors) also merchants, and pirates? Didn't the Athenian warrior class allow some part of its power to slip away to a banking class? Warriors aren't the be all and end all of power, they don't make all the choices. It's not really an application of Diamond's theories per se. It's the idea that to have an industrial revolution you need masses of free and cheap labor pooring into the city in search of a manufacturing job for lack of jobs in the countryside. My idea is that Greek geographical characteristics are such that there is an upper bound on labor productivity in the agricultural sector (at least compared to the climatic conditions and the rich soils prevailing in Nothern Europe and Brittain.) Hence, the share of society that had to keeping working in the fields in order to feed the the share that was carving vases, inventing pre-modern science, etc. One important aspect of industrialization (as opposed to the type of small-scale manufacturing that was done throughout Europe from approximately the 16th century onwards) is precisely scale. And for scale, you need a sufficient number of workers, to move from a manufacture to a factory. 2) Manufactured information changed how ideas were distributed. Many of these ideas included methods of making machines. These ideas weren't constrained to the intellectual class or nobility, they were written in vernacular and widely read at low cost. The proliferation of books enabled a process of cumulative technological progress. Before this time, science and technology would wink out due to the death of the individual that produced it. 3) There were more people (many more than a city state had). More people means that there were markets of sufficient size within localities (where transportation didn't represent the vast majority of product cost or risk) to justify machine enabled production. 4) A much higher percentage of people were free and had money to invest and spend. These people were the formative elements of the intellectual and financial middle class. The rights that protected them were enshrined in a code of common law that applied to all. Magna Carta 1215. 5) Relative peace. England is an island and a result was relatively secure against the depredations of continental military giants. Athens in contrast was in a constant state of military flux. Does anyone today really know what Greek Fire was ... it sounds like some kind of Buck Rogers Ray Gun using reflected light. The ancients invented what was needed for the ruling classes power over the masses and what was needed for the battlefield, provided they had the imagination to see the possibilities. Did transportation networks belong to the rulers, military, whatever ship captains could defend? It was not commerce as we know it today. I think the rate of literacy, and freedom to explore outside the pigeon hole your masters have put you in, plays a role. What is the risk that anything you create is going to be seized by more powerful higher ups in society? When were laws about Intellectual Property created so that the creators had incentives similar to what we have today? How large was the middle class? If most people were either worker class without much freedom of choice, and ruler class happy with what they had, where was the drive for invention? We can look at recent history of 3rd world pace of development relationship to its support for a middle class. How come there are some small nations in Asia with very rapid development, while large countries in Africa in stagnation? I think it is support for economic freedom of a middle class. There may be a lesson for us there in how Homeland Security is implemented. We need a strong free economy to survive long term. There is a name for this kind of theorizing in Science Fiction ... it is called Alternate Histories. If some modern man fell back in time and survived the diseases and figuring out the languages and how not to give serious offense, you end up with a novel like L. Sprague de Camp's Lest Darkness Fall, and a whole bunch others of similar genre.